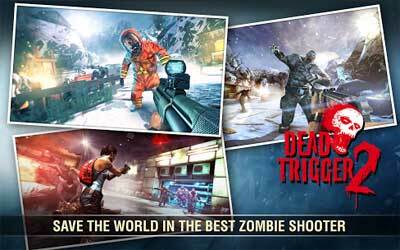 DEAD TRIGGER 2 APK 1.1.1 is claimed to be the best zombie apocalypse themed first person shooter game. It is the improvement from previous version that has major issue related to the platform. The Madfinger Games really did a good job with the graphic and the control of this game. The background story of this free game is about a dark world where the humanity has to fight with the zombie. You can explore 33 different unique places and defeat the entire zombie to save the humanity. To make the gameplay more interactive, it offers more than 600 gameplay scenarios. The graphic uses 3D technology from Unity game engine. Therefore, the image quality of this game is comparable to console game. This game offers various features such as mission that you can finish. You can finish the main quest or doing the side mission quest to achieve the best score. Gandhi and Sprinter tournament tweaks: Blueprints now drop in these tournaments also.